a fully enclosed sun lounge, private off-street parking, a drying room and free Wi-Fi. 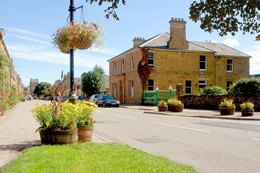 Centrally situated just 8 minutes walk from the Clubhouse, the Bank House is a Grade II Listed Building. We have 5 quality letting superking, king, double or twin rooms, all en suitewith whirlpool baths, new digital TVs and very comfortable chairs to relax after golf. We are close to all other restaurants in town and have private car parking in the garden grounds. Our rooms are large enough for two sharing comfortably but we welcome single occupancy enquiries. Amalfi is located a mere 300 yds from the 1st tee on the championship course at Royal Dornoch, and alongside the Struie Course. There is private parking at the house, which means you can leave your car here and enjoy your 19th hole in the comforts of the clubhouse after your round. Spacious en-suite rooms, comfortable beds, wonderful hearty breakfasts and a warm welcome await you. Sule Skerry is a short walk from the Club House, and a few yards from restaurants and shops. Both our spacious comfortable rooms, renovated in 2010, are en-suite with wi-fi, hair dryers and facilities for making hot drinks. 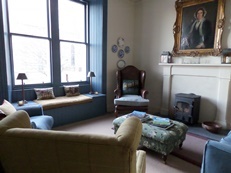 Guests are welcome to use the cosy sitting room with TV and log fire. 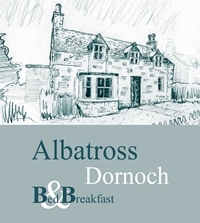 Albatross Bed & Breakfast is a delightful late 1800's traditional Scottish town cottage, newly refurbished in 2016,we have Twin or Double Rooms all En Suite and the local amenities / golf club are but seconds & minutes away from our house which lies on the corner of Sutherland Road and Castle Street. We look forward to welcoming you to our home in this special part of Scotland, there's no better place to create new memories - Queila & Matthew Harris. Highcroft is an original Croft House, renovated and upgraded to a high standard, providing two comfortable, double en-suite bedrooms. 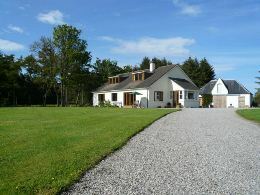 With stunning uninterrupted views across farmland, the Dornoch Firth and the mountains beyond. Consistently awarded 5 stars by the AA for guest accommodation and breakfast. 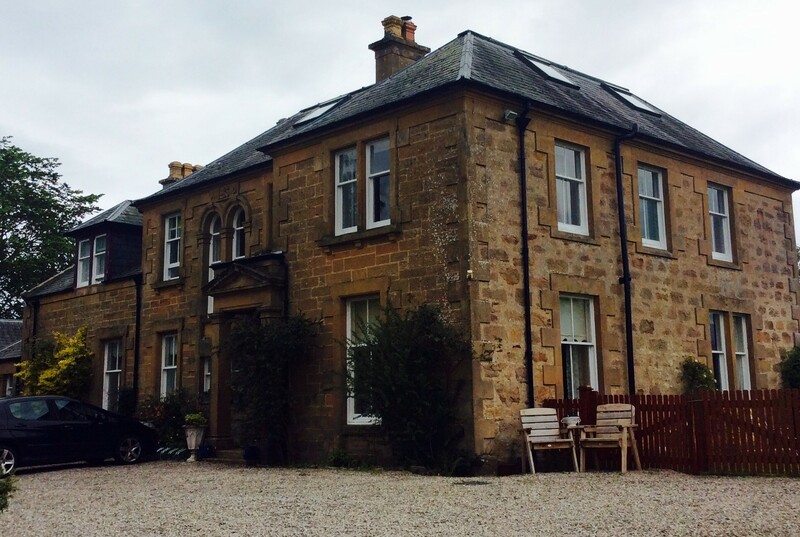 Kerensa offers her guests the best of Highland Hospitality in an unassuming Victorian townhouse in the centre of Dornoch, just around the corner from Dornoch Cathedral and a brisk 5 minute walk to Royal Dornoch Golf Club. Alongside the AA, The Good Hotel Guide, Michelin, Scotland the Best, Fodors, Frommers, Lonely Planet, The Rough Guide and lately National Geographic Travel have all elected to have 2 Quail as an entry into their guides. Enjoy a warm home-from-home atmosphere in tastefully decorated bedrooms equipped with modern en-suite power showers, quality towels and first class toiletries. There is Free Wi-fi throughout with a book-lined library/lounge where you can relax during the day or in the evening enjoy a comforting wee dram as a night cap. Quote ref: 'rdgc1616' to see if there are any preferential ratesavailable for 3 nights or more. (Seasons vary) We wish you 'Welcome to the Highlands' and enjoy a wonderful stay in Dornoch. Luxury Accommodation with the charm, elegance and hospitality of Scotland's finest small boutique accommodation, adjacent to the Cathedral and a short walk from Royal Dornoch Golf Club. 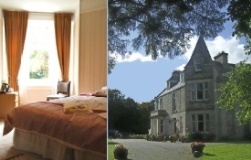 4 minutes walk to the 1st at the Royal Dornoch, Woodlands is a small, friendly, family-run B&B which is so peaceful considering its super location equally close to the Golf Course and Cathedral in the centre of Dornoch. Bedrooms are ensuite double, twin or single with self catering an option with your own fitted kitchen in two rooms. The secluded tree lined garden has private parking and tables and chairs for residents use. Proprietors Alistair and Bel Shepherd also own the Dornoch Inn in the centre of Dornoch, so as an added bonus, guests enjoy 20% off all meals at the Dornoch Inn! 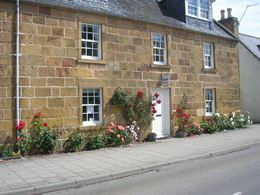 Boutique Bed & Breakfast in Balnapolaig, Dornoch The Steading is a bespoke guest house in Balnapolaig, Dornoch, which combines thoughtful accommodation with good old fashioned hospitality. 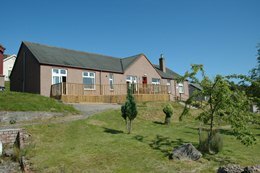 Set within a peaceful semi-rural location five minutes from Dornoch Championship Golf Course and affording spectacular views across the Dornoch Firth to Struie Hill, the great Caledonian pinewoods and mountain ranges beyond. 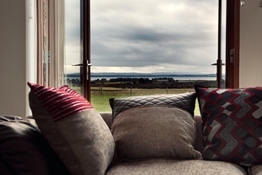 The Steading is designed for guests who seek tranquility and home comforts coupled with a five star experience. We believe that exceptional accommodation is characterised by soothing decors, super comfortable beds, spotless bathrooms and healthy breakfasts served as early as you need. Our guest house offers four beautifully appointed en suite bedrooms with super kingsize beds, and the space and facilities to relax or work, you choose. The Steading is unique in that we have our own mini-bus which is used for free transfers to the course and is available for hire including airport transfers.We also have secure garage lock-up for golf clubs and free parking. 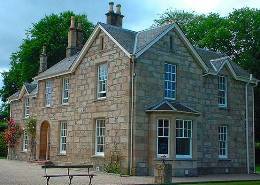 The Old Manse is large Old house which has recently been renovated to accommodate bed and breakfast guests Full Scottish breakfast is included in the price also free off street parking and secure storage of golf equipment. We are only a few minutes walk away from shops and restaurants and a ten minute walk to golf club FREE WIFI included. Strath View is 4 star STB graded accommodation set in 1.5 acres of ground, situated approx 6 miles from Royal Dornoch Golf Course. Overlooking Loch Fleet, there's no hustle and bustle here, just peace, stunning views and the odd bit of wildlife. We can offer you drying facilites, more than ample parking space, free WiFi, tv/dvd player in each room, all rooms are ensuite. We have two double rooms each with king size beds and a triple/family room with 3 full sized single beds and one folding bed, and a generous breakfast. Golf View is located on the edge of the Royal Burgh of Tain and enjoys uninterrupted views over Tain Golf Course and the Dornoch Firth. This former manse is situated at the end of a long driveway where there is ample parking in our large, private parking area. We have Michelin and Visit Scotland 4 Star accreditation and offer five comfortable ensuite bedrooms, a spacious dining room and guest lounge with sea view. 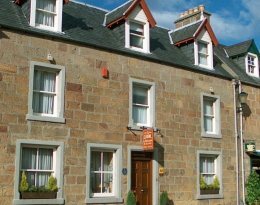 Our rooms have all modern amenities whilst retaining much of the rustic charm of an early 19th Century manse. 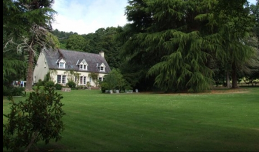 Dating from the 1780s and set in woodland gardens with plenty of private parking. We offer spacious double and twin ensuite rooms with tea and coffee making facilities, flat screen televisions and WiFi. The comfortable guest lounge, overlooking the garden, has a cosy wood burner to help you unwind. Drying facilities are available. A warm welcome awaits at The Old Manse. 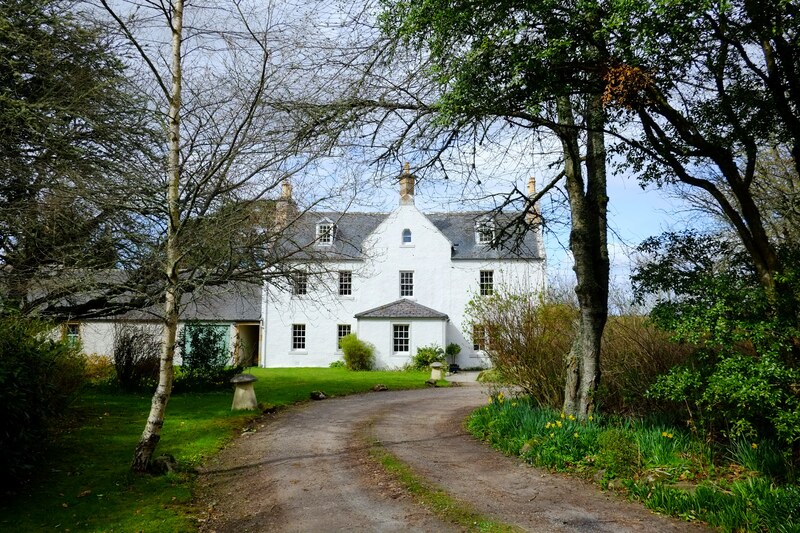 Overlooking the Cromarty Firth, Wemyss House is set in a peaceful rural landscape near the Royal Burgh of Tain. Furnished with local rugs and tweeds, with furniture handmade by Stuart, the three spacious guest rooms have large en-suites together with all the facilities to make your stay extra special. Local, organic, and home-grown produce, including eggs from the Wemyss House hens, are carefully cooked on the Aga for your breakfast and after a great day on the golf course, delicious evening meals are available by arrangement to come home to. With ‘Red House’ classification from Michelin you can be assured of a warm welcome and a comfortable stay at Wemyss House. 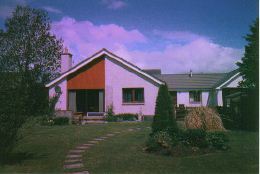 Cartomie B&B is only 10 miles from the Royal Dornoch Golf Club and is a modern bungalow in a rural setting close to the scenic Dornoch Firth. We are a non-smoking household with two en-suite rooms. One double with en-suite shower and one king-size double/twin with en-suite bath/shower. 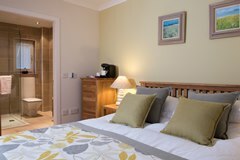 Both rooms are equipped with hairdryer, flat screen freesat television and tea and coffee making facilities. You can enjoy the sunsets in the evening and have breakfast in the morning in the conservatory with lovely panoramic views of Struie Hill. 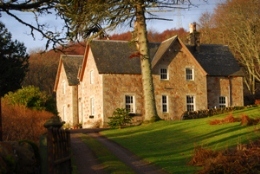 Originally built in 1850 as a farmhouse for Sutherland Estates, Culgower House lies just north of Dornoch, between Brora and Helmsdale, on the scenic East Sutherland coast. We have glorious views over the sea and offer tranquil, contemporary, high quality bed and breakfast. A great base from which to play the golf courses of the north Highlands or for a stop en-route to Orkney. 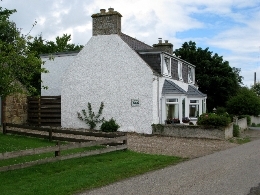 Located directly on the foreshore of Cromarty Firth where you can enjoy stunning scenery. Evening meals available. Fully licensed. 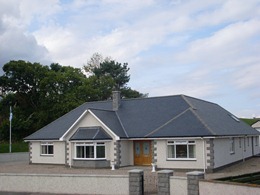 Come and enjoy a great Highland welcome at our Bed and Breakfast. If you wish we can completely spoil and pamper you. We can collect you from Inverness Airport, and deliver you back there. After a full breakfast we’ll take you to the Golf Course, organise caddies and lunch, collect you and then take you sight-seeing or shopping. At night we'll deliver you to the restaurant of your choice, collect you after your meal and take you back to Drynie. Or, just come and stay and do your own thing! Guests enjoy our 20 acres of beautiful parkland and paddocks with its itinerant wildlife, our Mid/Short iron practice range and also our full sized billiards/snooker table with other sports/leisure equipment in our Games Room. 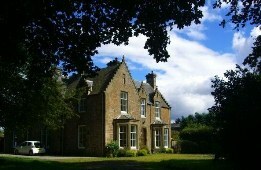 Morayston House is a Victorian mansion built in 1878, offering high class bed and breakfast accommodation. Open all year round, this 5 Star guesthouse, a former Dairy Farm offers six luxury and flexible bedrooms. Easy access to A96, only an hours drive from Royal Dornoch Golf Club, yet only a few minutes walk to fantastic beaches and Nairn Golf Club. Castle Stuart Golf Links and Inverness Airport is only a 15 minute drive. Free Wifi. 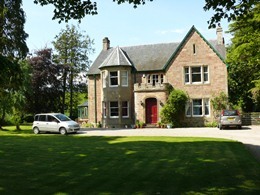 Flowerburn is a small and relaxing bed and breakfast on the edge of Nairn. 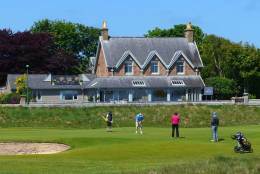 Only an hours drive to the Royal Dornoch Golf Club and a short walk to The Nairn Golf Club and beautiful beaches. Our 3 en-suite rooms are all tastefully decorated and the garden a haven of tranquillity. At Flowerburn we aim to provide quality accommodation with a delicious breakfast in a friendly and relaxed environment. Our rooms are modern with coffee/tea pods, Smart TV's and Bluetooth speakers. Breakfast is served in the conservatory which overlooks the garden and ingredients are locally sourced and cooked to order.